Peace, Love & Scrapbooking: Gift Card Giveaway Hop! The Gift Card Giveaway Hop will run from Dec. 9th to 13th. Thanks to I Am A Reader, Not A Writer and Attack of the Book for co-hosting this amazing blog hop. The Gift Card Giveaway Hop is just in time to help with with last minute holiday shopping!! 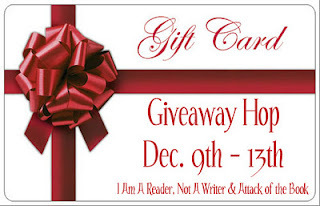 Over 100 Blogs are each hosting a giveaway for a gift card. One lucky winner will be emailed a $15 gift card from Amazon.com. Open to anyone who can use a gift card sent from Amazon.com. Alternately if you win and can't use an amazon.com gift card you my choose a book of your choice from The Book Depository (Up to $15). Check out the other $15 Amazon Gift Card I am giving away at Seaside Book Nook! Here is a link the host, where all participating blogs are linked! Kindle Fire is on my list. Thank you for the giveaway! Happy holidays! I really want Wreck This Journal by Keri Smith. Thanks! Happy Holidays! A kindle Fire so I can start reading the amazing books I'm missing out on. Any of my favorite books I don't have in paperback & a kindle. I have books at the very top of my wishlist. More specifically Soul Screamers 3-5. Thanks for the chance to win! I would love to have a Kindle Fire but I haven't told anyone. Maybe Santa will know, lol. I would live a kindle. Thanks for the giveaway! I would love a kindle. I would love to get a new MacBook! Thanks! I so want a Kitchen-Aid mixer! I would love the book, 'The Help". For this Holiday, I would love to win Hourglass by myra McEntire! I really want a new digital camera since my son broke mine! One item on my wish list is a new pair of slippers! The top of the list is an iPAD. Oh and I forgot to write my FB name in the entry, I'm sorry. It's Margarita Kancheva. I would love an ipad2 Santa Baby. Thanks for the giveaway! I need a new robe for Christmas, hopefully I'll get one. I just want books on my wishlist or Amazon giftcards! Thank you very much what a great giveaway! Kindle Fire is the top item on my wish list this year. Thanks for being part of the hop and for the chance to win such a great prize! I would like an ipad for xmas. I would like The Sims 3 Pets for PC. Thanks for the awesome giveaway! We don't exchange Xmas gifts. We don't have the money to do so. We give to the kids instead. Another item on my wish list is family room furniture. My wish list would include giftcards for books. Also, I hope Santa gives you all you wish for! On my holiday wish list is an IPad. I only have 1 item on my wish list - I need a jewelry box that will let my necklaces hang, and I would like it to be an antique. Or at least hand made. Hmmm, I don't have a Christmas Wishlist but one thing we'll be doing over the holidays is stripping our basement for a foundation repair so, would winning the lottery count?? LOL! I want to get some books for Christmas. new cover for my Kindle is on my Christmas list. I would love some books! Thanks for the giveaway. I saw the Book Depository as an option so I presume it's international? I would like a book of poetry by Rumi. in my wish list is a tablet I don't know wich one. I would love a Keurig coffeemaker for Christmas! I'm hoping I'll get Bleeding Hearts by Alyxandra Harvey for Christmas. I have a Nook on my wish list. kindle fire is on my wishlist. I am hoping for a phone. thank you for the awesome giveaways! i also have a participating blog in this great giveaway blog hop. I would love a flip cam and a Kindle or Nook. Thanks for the another great giveaway and for participating in this blog hop! Another thing on the top of my list is an iPod. Thank you so much for this giveaway! One item on my wishlist is an amazing YA book - any, if it's incredibly well written and moving. Hopefully one of my friends gets me one of their favorites! I really want books! Catching Fire and Mockingjay, to be exact lol. Thanks for the awesome giveaway! I want Clockwork Prince by Cassandra Clare! And any other book I can get my hands on!!! I would love a desk lamp. one item on my list is a kindle fire! on my wish list is a gift certificate to a Scrapbooking store so i can get me a Cricket! Most of my wish list is books including Wisdom's Kiss. I want a Kindle Fire soooo bad! Thanks for the giveaway !!! I have Crossed by Ally Condie in my wishlist. I would really like a Kindle with a touchscreen. Not pick about which one. I would love a new kindle or nook! I would love a kindle fire! I want an I-pad. I plan on buying it for myself as a gift with my bonus from work if I ever get it. Gift cards are on my wishlist so I can combine them and get what I want. I want a Kindle Fire. I'd like an Kindle Fire. I am hoping to get the books Vampire Academy! All my friends are raving about them! Shatter Me by Tahereh Mafi or Daughter of Smoke and Bone by Laini Taylor. An ipad with all the bells & whistles! Best wishes and thanks for a chance to win this fabulicious gift card giveaway hop! An Amazon Kindle Fire is on my holiday wish ヅ *Thanks* for the giveaway! Thank you so much for the giveaway opportunity! Happy Holidays! Always on my wishlist - books :) Thank you for your generosity! Happy Holidays!